Surrounded by the majestic Cabinet Mountains, this luxurious suite, with nature-inspired décor, is located in Sandpoint, northern Idaho, and is ideal for a romantic and relaxing getaway. With a king-size bed and the possibility of requesting a rollaway bed, this heavenly escape can accommodate up to three guests. Other amenities include Wi-Fi throughout, a fully stocked kitchenette, and complimentary tea and coffee. With copper ceilings, neutral colors, this nature-inspired oasis will leave glampers in awe. Guests will melt into the comfortable bed outfitted with fine linens after a long day exploring the stunning wilderness. The room also features a plush armchair great for taking an afternoon nap, as well as a desk where glampers can jot memories in their journals. 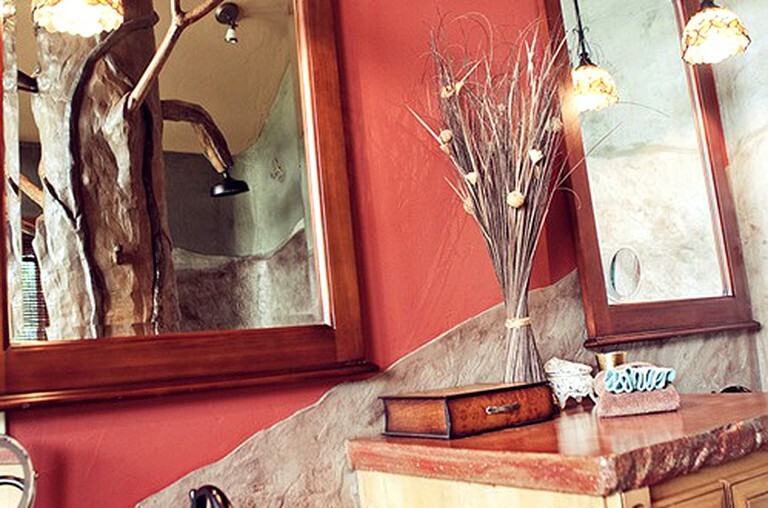 The bathroom features a jetted tub, perfect for two, as well as a unique double-headed tree shower. This stunning retreat has everything guests need for a delightful stay, including quality linens and plush towels. Additionally, there is Wi-Fi throughout the property, along with central air conditioning and heating. Furthermore, a delicious organic breakfast is available every morning in the Great Room. Guests can enjoy the most important meal of the day out on the deck, at the family table, or in their rooms. For quality entertainment, guests will find a communal movie theater room, countless board games, and an extensive library to get lost in a good book while relaxing in the early afternoon. The rental also has a piano in the communal area for musicians who want to let their inner Beethoven shine. Outside, glampers will find a pool to take a refreshing dip after exploring the nearby trails and a hot tub great for relaxing. Guests have full access to the grounds, which feature a pond, an organic garden, a waterfall, and a nature trail. Additionally, there are communal bikes glampers can use to explore the surrounding area. Guests can continue enjoying the beautiful grounds at night by gathering around the fire pits to marvel at the starry-night sky. An airport shuttle service is available. Please ask the host for more information. The property allows weddings and special events. Please inquire with the host for more information and prices. Massages are available upon request. Guests are asked to please make their appointment at least forty-eight hours in advance. From hiking, biking, and horseback riding the countless trails while exploring the beautiful terrain to browsing through antique shops to ice fishing, there are always great options to stay busy while staying at this gorgeous retreat, no matter the season. During spring and summer, guests can head out to nearby lakes and rivers, including Lake Pend Oreille and Pack River, in the early morning for fantastic rafting, kayaking, and tubing before spending the rest of the day on the shores soaking up the sun, enjoying a lovely picnic, and diving into the crisp waters from time to time. Fishing enthusiasts can venture to Cocolalla Lake and try to reel in a variety of fish, including Rainbow Trout, Largemouth Bass, and Yellow Perch, while golfers can tee off at the Idaho Club Golf Course. Starting in June, friends and families can head to nearby farms for blueberry, raspberry, and strawberry picking before heading to the movie theater in the heart of Sandpoint. In the winter, glampers can head to Schweitzer Mountain to ski or snowboard the snowy slopes or go tubing with the family. Glampers can also explore the beautiful snow-covered terrain by snowshoeing through numerous trails to admire Idaho’s natural beauty during the colder months of the year before heading home to kick back and relax while sipping on a mug of hot cocoa. This glamping site is dog-friendly, however, owners are asked to keep their furry friends off all furniture. The accommodation is non-smoking. Guests are asked to please shower before using the communal hot tub.